The National Rifle Association's newest ad campaign is moving in a bold new direction. The organization's latest promotional video features no scripted lines at all. It's just a TV playing the news, and a grimacing, sledgehammer-toting Grant Stinchfield who clearly and quite expressively doesn't like it very much. 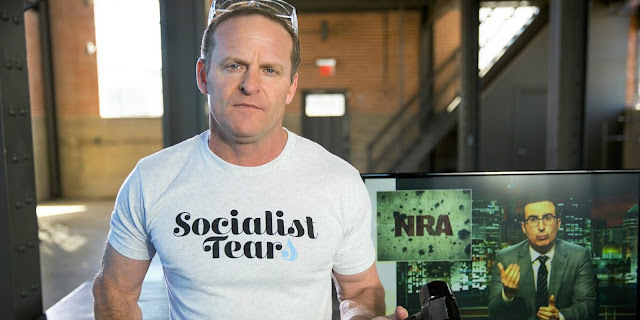 Stinchfield, who is wearing a 'Socialist Tears' T-shirt stands in front of a flat-screen TV displaying a series of anti-Trump, pro-gun-control sound bites from CNN anchors, John Oliver, and other 'enemies of the state.' After silently digesting these anti-American diatribes, he dons a pair of safety goggles (as safety is clearly and somewhat ironically a priority for him), turns around, and smashes the TV with his ginormous hammer, which then reveals their slogan... “The truth is our greatest weapon.” This leads one to deduce that the hammer is a physical metaphor - a truth-smashing weapon for the NRA or it's just an excuse to break Sh**. Either way, the video quickly kicked up a Twitter storm because it makes no sense. Between the video’s awkward macho demeanor and Stinchfield’s “Socialist Tears’ t-shirt, NRATV’s ad is turning into one hell of a viral fiasco.